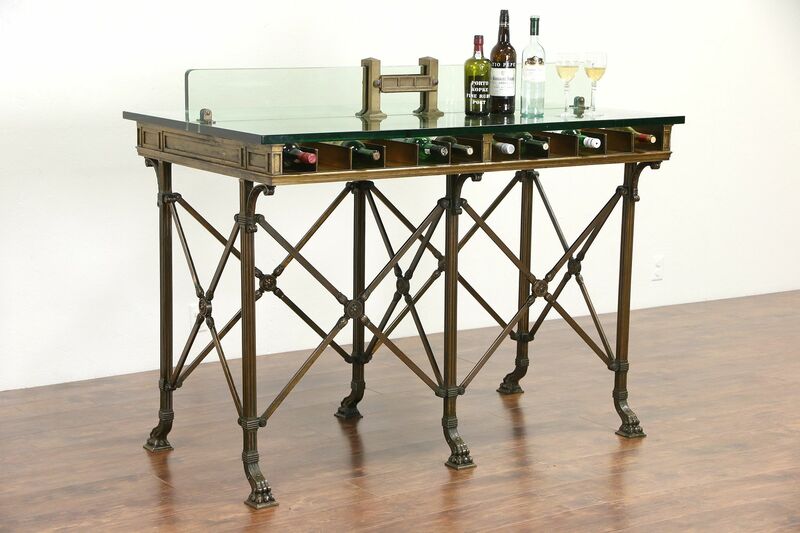 Architectural salvage from a Wisconsin bank and dating the early 1900's, this splendid bronze and glass lobby counter could serve as a kitchen island or wine and appetizer table. Solid genuine cast bronze with some sheet metal panels underneath, the oiled finish has wonderful antique patina with wear as shown. This counter rests on a classical motif base that is 36 1/2" tall. The 4 1/2" tall stacking center section is also bronze with four removable cubicle sections meant for deposit slips but nice for wine bottles. The 1" thick glass top has scratches and flakes around the holes, see photos. A detachable 1" thick glass divider has a bronze holder for a perpetual calendar, the changeable numbers and days are lost. Divider size is 60" long, the glass is 6" tall and the bronze calendar holder is 7 1/2" tall. Dimensions if assembled as original is 60" long, 36" wide, height is 42" to the top of the flat glass, if including the removable calendar, height is 49 1/2" overall. The glass top could be placed directly on the base as well. Weight is substantial, the bronze base is 134 lbs., the cubicle section is 183 lbs., the glass top is 194 lbs. and the divider is 40 lbs., for a total weight of about 534 lbs.